The bad news from last week's economic reports is that the United States economy may already be falling into recession. To make things worse, the Japanese economy may be doing the same too. And the similarity between the two may not end there. However, before we get to the last point, let's look at the latest economic indicators. The Labor Department reported on Friday that US non-farm payrolls shrank by 80,000 in March. Based on the establishment survey, this was the third consecutive month that the economy has lost jobs and the biggest decline since March 2003. According to the household survey, employment fell by 24,000 in March and the unemployment rate rose to 5.1 percent, the highest level since September 2005. With the latest decline, employment in the US in March was barely higher than a year ago according to the establishment survey. Indeed, based on the household survey, the level of employment in March was actually lower than a year ago. So it is beginning to look like the US economy will see a contraction in the first quarter. 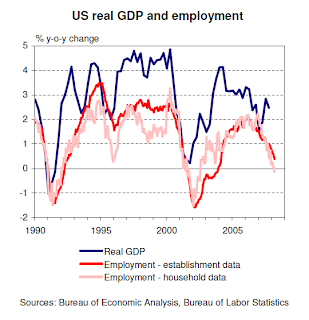 The deterioration of the labour market in the US is showing no sign of let-up. This is typically how recessions begin. A recession in housing has already been on-going for some time, but last week provided further evidence that weakness in construction spending is spreading beyond housing. Spending on commercial construction declined 0.1 percent in February from the previous month, contributing negatively to a 0.3 percent decline in overall construction spending. And weakness has also spread to manufacturing. On Wednesday, the Commerce Department reported that factory orders fell by 1.3 percent in February. This followed a 2.3 percent decline in January. The reports from the Institute for Supply Management (ISM) last week also pointed to weakness in the economy. The manufacturing index came in at 48.6 in March, slightly up from 48.3 in February but staying below 50, indicating a contraction. The non-manufacturing index also saw a similar bounce to 49.6 in March from 49.3 in February but also stayed below 50. The purchasing managers' indices generally held up in other major economies in the world. One notable exception was Japan's. The manufacturing PMI for Japan dropped below 50 in March, indicating contraction. This indication was corroborated by a report from the Ministry of Economy, Trade and Industry last week that showed that Japanese industrial production fell 1.2 percent in February, the second month of decline after output had fallen by 2.2 percent in January. This has ominous implications for the Japanese economy. 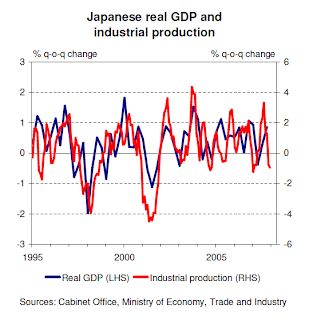 Historically, changes in Japanese gross domestic product closely match changes in Japanese industrial production. So there is a very real possibility of the Japanese economy accompanying the US economy into negative growth in the first quarter. This means there is a risk that the global economy may be hit by a double whammy of recessions in both the US and Japan at the same time. Beyond the possibility of a simultaneous dip into recession, the more intriguing comparison between the US and Japan for many observers has been whether the US could be following Japan's deflationary path of the 1990s. In the wake of the recent disruption in credit markets, there is fear that deleveraging among financial institutions in the US could lead to credit contraction and a similar deflationary outcome. One of the oft-cited objections to the likelihood of deflation in the US is that its economy is currently experiencing elevated inflation, the opposite of deflation. 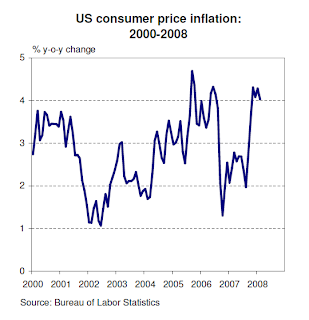 While consumer price inflation did threaten to go into negative territory in 2002, determined easing of monetary policy by the Federal Reserve reversed that trend. Since then, inflation has surged back up and is now just over 4 percent. A look back at the Japanese experience from about two decades ago provides us with an illuminating comparison. 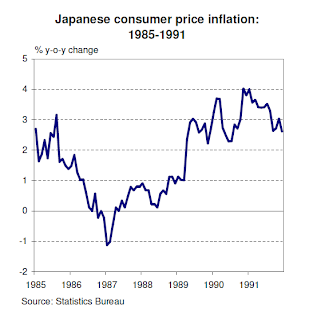 In the mid-1980s, Japan had also experienced disinflation, with consumer price inflation actually dipping into negative territory around 1986-1987. Easier monetary policy from the Bank of Japan eventually reversed that trend. Inflation then turned around so much that it surged and peaked at 4 percent in late 1990 and early 1991, roughly at the same time as the peak in land prices and about one year after the peak in the stock market. In other words, immediately at the end of its asset bubbles, "deflationary Japan" actually saw inflation levels almost as high as "inflationary US" is seeing today. It was only from the mid-1990s onwards that deflation became a persistent feature in Japan. Obviously, there are many other factors that will determine the future path of the US economy. The above comparison does not mean that deflation is necessarily imminent in the US. Nevertheless, if Japan taught us anything, it is that today's inflation does not confer an economy immunity from tomorrow's deflation. In fact, it may be a precursor to deflation.